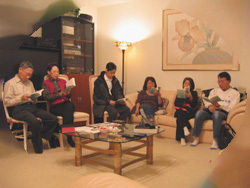 In June 1992, five Cantonese families gathered together and formed a "renew group" with the goal of following Jesus in our life through sharing and caring of each other. Our baptism into a Christian life is only the start of faith journey and not the finish mark. It is necessary for the baptised to continue and follow Jesus in their daily life. Ascension Chinese Mission Houston ~ Sacred Stories from William Watson SJ on Vimeo. Sugar Land Bible Sharing Group has recently finished a series of spiritual exercises called 40 Weeks developed by Fr. Bill Watson, SJ. This is a new rendition of St. Ignatius’s Spiritual Exercise focusing on the daily Examen. The Bible Sharing Group started the 40 Weeks spiritual journey on January 22, 2018 and completed it on October 22, 2018. The heart of this spiritual exercise is a daily 15 minute Examen with additional brief spiritual mindfulness throughout the day and a spiritual journaling at the end of the day, week and month. Committing to such a long spiritual journey is not easy, but it certainly bears fruit for a long haul. 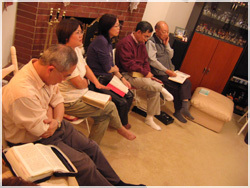 Members of the Bible Sharing Group have raised a good habit (virtue) and will continue doing this spiritual exercise. Some of them have shared their experience in a video requested by Fr. Bill as one of the themes for the monthly Newsletter of Fr. Bill’s Sacred Story Institute website. If anyone is interested in doing this spiritual exercise, we are able to help you start. The material can be downloaded from Formed.org (parish code: 3ea3b0 if you do not have an account). · Help us encounter the Lord of Mercy daily. · Promote fruitful engaging in regular Sacramental Reconciliation. · Help us learn the art of spiritual discernment.